What is the value of packaging craft beer in bottles versus cans? 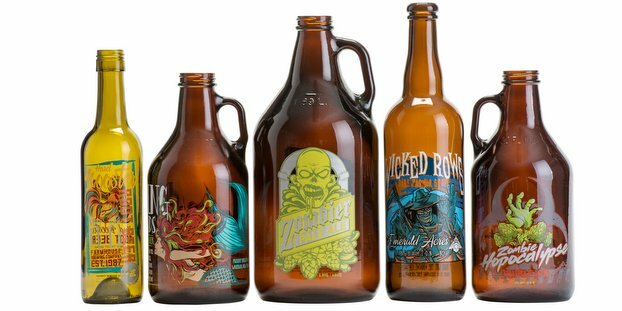 UV screen printing is just one of several bottling customization trends happening in the craft beer world right now. Photo courtesy of Waterloo Container Co. The headline news in craft beer packaging the last few years has been the adoption of cans. More craft brewers are canning than ever before thanks to improvements in the packaging (better quality) and the influx of mobile canning operations. Headline abundance has a counter effect though. While the trend is real, media saturation tends to overstate the reality somewhat. It’s like that old story of when shark attacks get in the news. People start to worry about being killed by a shark, despite there being greater odds that a vending machine topples over and kills them. So, yes, a lot of brewers these days are going with cans, but a ton of craft breweries are also going with bottles too. Remember, there are just A LOT of brewers out there, so any single category could be considered a trend, if hyped enough. Bottles just don’t receive any hype because they have always been here. Bottles are just kind of assumed, but assumption doesn’t speak to growth. According to the latest IRI data, glass continues to grow in high-end beer segments like imports, FMBs and craft, and that trend is expected to continue going forward. “We are not changing our forecasts for glass production or procurement because we are still seeing growth in glass containers in the beverage industry,” said Bobbi Stebbins, sales and marketing project leader, Waterloo Container (which you can find through the Kinnek purchasing platform too). Stebbins relayed that there is definitely a noticeable increase in canning in their region, but this movement is not without its own obstacles. The canning boom is not without its issues for some smaller craft brewers. The boom in demand is not being fully met by supply, and larger can providers have focused more on their larger accounts, raising minimums and some (we’ve heard anecdotally) have just flat out told some previous customers that they would no longer supply them with cans. These are not issues when packaging in bottles. Waterloo Container, for example, has no minimums for bottle purchase on its stock items. Forming a relationship with your supplier and providing an accurate forecast will only help. Since glass production (manufacturing campaigns) requires advanced planning, Stebbins encouraged established clients to forecast their needs for the coming year to ensure there is an adequate amount of their glasses on-hand. “This is as important for the niche and boutique brewers as it is for our larger clients,” she said. No inventory space? Be sure to work with a vendor that can provide inventory management and storage or simply fulfill your order as you place it. Waterloo has over 275,000 square feet of storage space, which they use to help their clients manage their ware. “It can be reassuring to a brewery to know that their ware is secured and available to them immediately as their own space opens up,” Stebbins said. “If they have their own bottling lines, they can have the bottle delivery trucks scheduled so they pull the bottles off the truck and put them directly on the line,” Gribble said. What’s cool about bottles? We answer that and talk customization trends, screen printing and more on page 2. BtoBeer liked this on Facebook.